Out in rural northeastern Pennsylvania, I run into a fair number of rednecks. Many of them are way too free with their use of the "N-word." But if they ran across an actual black person waving for help by his broken-down car along the side of Route Six, many of them would stop to help, and even let the driver use their cell phone to call a friend or spouse. In gentrified Brooklyn, I run into boatloads of progressives. None of them ever, ever would use the "N-word." But in many cases, if a black person has broken down along the side of Fourth Avenue, and he is blocking their way to the buy-one-get-one-free sale on miso-infused kale chips at the Park Slope Co-op, the black fellow better be ready to jump for the curb. One of the silliest posters seen in the halls of our educational establishments. You're supposed to take it on the authority of your teacher or professor that you ought to "question authority"! In fact, to become educated at all, you must except the fact that all sorts of people are authorities in subjects in which you are not yet (and perhaps never will be) an authority. When I hire a student finishing his PhD as my math tutor, I must recognize that he has an authority discussing mathematics that I have not, otherwise the hiring of him is completely pointless. A link between increased immigration and increased crime? While researching the cause of the apparent (as Shonk noted, it may be an artifact of bad stats) spike in the homicide rate in the early 1900s, the tremendous immigration of that first decade popped out as a possible cause. I googled to find out what has been said about that, and discovered papers like this. What is interesting is that researchers have been purporting to answer the question of whether a high rate of immigration might lead to a surge in crime, but in fact seem to be answering the question "Are immigrants more likely to be criminals than the native born?" The paper linked to above discusses earlier studies, and they all seem to have proceeded in the same way, by examining incarceration rates for immigrants versus natives, to see if immigrants are more likely to be criminals. Mises held that labor is (almost) always something to be avoided in life, that it has disutility, and that the only point of it is to be able to purchase consumer goods. Interestingly, he recognized an exception: himself. He didn't dislike his work; in fact, he lived for it. So he created a separate category of human being to explain this: the creative genius. "As a former Marxist, his analysis always held labor, particularly when self-directed or done voluntarily in cooperation with others, in high esteem because of the ethic of responsibility it produced. Work wasn’t, or shouldn’t be, just a means to put food on the table or a roof over your head. Rather it provided meaning, dignity, and moral instruction, something not found by repeating mind-numbing tasks over and over at someone else’s direction." What is striking to me here is this weird double-humped shape and the huge variation in the amount of murder. 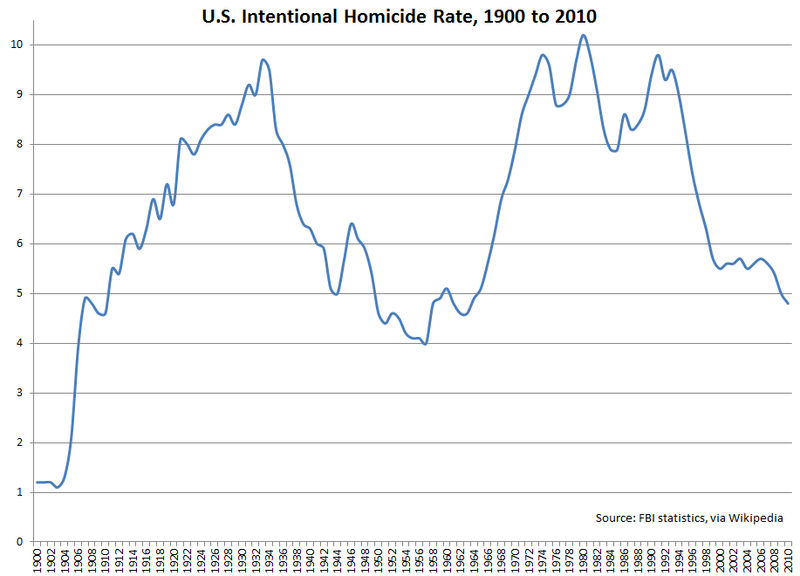 Look at the spike from 1900 - 1934: the homicide rate went up about ten times! In fact, in the first decade of that period, it rose about five times. Prohibition can explain some of the rise in the 1920s, but clearly the real lift-off happened well before that: so what caused that rise? Also of note: the "everything is getting better in every way" folks point to the recent drop in homicide as evidence supporting their thesis. But if you run your trend line back to 1900, that's not going to work, is it? Mises famously contended that there is no third way between socialism and laissez faire. This was an odd contention on his part, since we'd also have to say that according to him we've always been on a third way: pure socialism is not possible (I think Mises was right about this) and we have never had a pure market economy (also, I think, not possible). Now, Mises was terribly wrong about some things, but he certainly wasn't stupid, so: how did he reconcile these two seemingly disparate ideas? Can you use them old U. S. Blues? Someone on my Facebook feed, who seems to be a fairly clever person (but not very wise), posted an essay in which she wrote, "Philosophy has now been totally subsumed by computer science." We come upon this sort of foolishness regularly: before computer science, philosophy was going to be totally subsumed by the physical sciences. It may be instructive to look at a couple of the problems with a view like this. Notice how Richard Dawkins deliberately tries to invert this natural hierarchy: he claims we conscious beings only exists as vehicles for our genetic material! This spiritual state is what is meant by "demonic possession." A final thought (I hope) on the current shibboleth of asserting, generally without any relevance to the discussion at hand, that humans are "just another ape," or that some topic "strains our ape brains." I am not a person who entertains any doubts that our ancestors were apes. Nor do I entertain any doubts that the literary ancestors of Anna Karenina were account books at temples and palaces, which seem to have been the first type of written document. But it is pretty silly to say that, therefore, "Anna Karenina is just another account book." I was recently asked to give a talk to the Radcliffe Alumni Association on the topic of inequality in America. "We'd like," they said, "for you to give us the libertarian perspective on this issue." "Well," I told them, "my own position is actually probably more distributist. But here's is my colleagues contact info..."
However, she turned them down. And so they came back to me and said, "Well, we'd love to get the distributist perspective on this topic!" So, now, having put my foot in it, I've got to learn something about distributism! Just warning you about what is coming up in this space. I'm starting on Chesterton tonight. Noah Smith displays typical nerd narcissism with this: "Movies like Revenge of the Nerds depicted nerds - people who liked to use their brains..."
I dare say that to succeed as a player in an NBA basketball game requires far more "brainpower" than does, say, writing decent computer code, or modeling financial flows. The latter activities tap a *very* specialized sort of brain function: manipulating formal, symbolic expressions. The former involves processing, in real time, a myriad of physical and interpersonal interactions. Think about this: which is it easier to program a computer to do, simplify an algebraic equation or lead a 3-on-2 fast break against two NBA defenders and choose the right pass or shot in tenths of a second? LeBron James "uses his brain" far more than the average academic. Lots and lots of people will tell you that heliocentrism was disturbing when it was first being debated because it "displaced humanity from the center of the universe." But when I ask actual historians of science about this, they say there is just no evidence for this at all. Here's is yet more testimony to this effect: the center of the universe was it cesspit, and at the very center was hell and the demons: the very worst place to be of all! To get out of the center was a promotion. Plato did not have "doctrines"
"First, in his Seventh Letter, Plato denies that the tyrant of Syracuse, Dionysius II, and his pseudointellectual courtiers could have known that about which he is serious (περὶ ὧν ἐγὼ σπουδάζω). They could not have understood it, “For there is no writing of mine about these things, nor will there ever be. For it is in no way a spoken thing like other lessons (ῥητὸν γὰρ οὐδαμῶς ἐστιν ὡς ἄλλα μαθήματα) . . . ” (341c1-6). This means not that Plato’s serious insights are secrets that, perhaps, could be divulged esoterically but, rather, that they are ineffable, impossible to encapsulate in either oral or written speech. Accordingly, we must not expect to find propositional truths about ultimate realities in any Platonic text." One picks up in this learning a second language, precisely when one realizes that it is only when one stops translating words into other words that one is really "thinking in the new language." A friend once told me, "I could read Hebrew very well, without knowing it." When asked what he meant, it turns out that he could pronounce Hebrew just fine, when required to do so at synagogue, without having any idea what he was pronouncing meant. But he was saying all the words correctly, and if language is thought, he must have been thinking! Clearly, there is something else behind the words one "gets" once one understands the language. And that can't be just more words, or we have an infinite regress. That something else is what Frege called the sense of an expression. But then it "leaked" into other expressions, such as "Il ne mange pas": "He doesn't eat (a step?)." Finally, 'pas' displaced the "true" negative from the sentence completely, so today one can simply say "Il mange pas": literally, "I eat a step." For more, see this site. I've always found the French intervention in Mexico in the 1860s to be a bizarre episode in history. Did Napoleon III really think this would work? In any case, I was describing the Second Mexican Empire to my wife tonight. I said, "Of course, the only reason the French could get away with this was the American Civil War. The Monroe Docrtine would have meant that France's moving troops into an independent country in the Americas was a cause for war, except that half of America was already fighting the other half, so we were really in no position to fight France as well." I paused for a moment, and then added, "Although, of course, that fact wouldn't have stopped everyone on Fox News from condemning Lincoln as 'weak' and possibly a French-allied traitor if he had failed to do so." Hmm... Now How in the World Could We Test That? If you are teaching architects in an undergraduate program, you probably can't test them by having them design a real building. Likewise, a professor of economics can't get a student to go run the Fed for a week, or advise a major investment bank. Your civil engineering students may not get to erect an actual bridge as their final. But I am pretty sure most places is with a computer science department have computers, and programming languages installed on those computers, so what is the puzzle here? You want to see if your student understands bubble sorts? Have her write a bubble sort! The secular often bring up statistics showing that people in the wealthiest countries are not very religious. These are presented with a smug grin: "Once people start to climb out of poverty, they abandon that religious nonsense!" Because, you see, no Christian could possibly explain the fact that people who have set their hearts on the pursuit of worldly goods could lose their souls. A nice interview with our frequent commenter Shonk. Now, I have little doubt that this equality is true. ("Little" because mathematicians do make mistakes.) And what maneuvers led from the first expression to the second one may be very obvious to some. But after playing around with each side of the equation for a while and not managing to turn one side into the other, I brought the book to a friend who is just finishing his Master's in mathematical education. He spent about 15 minutes toying with it, and also could not see how to move from one expression to the other. 'Young children learn by example, often copying the behavior of adults. I often see youngsters in strollers or on foot with a parent or caretaker who is chatting or texting on a cellphone instead of conversing with the children in their charge. Dr. Steiner-Adair said parents should think twice before using a mobile device when with their children. She suggests parents check email before the children get up, while they are in school, or after they go to bed. My neighborhood is filled with children of the elite who are being raised by indifferent nannies who spend the day pushing them around in strollers while staring at or talking into their phones. "So, avoiding occasionalism and thus pantheism also requires affirmation of immanent causal power and immanent teleology -- again, Aristotelian efficient and final causes." But if occasionalism or the Platonic theory of forms are, in fact, true, it is no argument against them to say that they lead to pantheism: that would just mean pantheism is true as well! And in any case, there is no inevitable slide from such views into pantheism. For instance, Berkeley's understanding that the world is God's ideas is not pantheistic: God's ideas are not God! This blog post is my idea, but you can't kill me by shooting it on the server where it resides. My review of How Dante Can Save Your Life is up at The University Bookman. Note: Keshav gets a shout out in the review. On page 69 of Anna Karinena, I finally meet… Anna Karinena! Imagine the reaction of a modern literary agent if given the manuscript like this: "Meanders about for dozens and dozens of pages without even introducing the main character: The writer has no idea what he is doing." It is amazing how different classic works of literature typically are from the advice given to writers in trade magazines and so forth. That advice comprises recipes for producing a Big Mac, indistinguishable from every other Big Mac except by the packaging. This week goes to E. K. L.'s mom! She has filed a suit (along with her daughter, E. K. L.) to force the U. S. federal government to draft women as well as men, arguing "“With both males and females available for such roles today, the two sexes are now similarly situated for draft registration purposes and there is no legitimate reason for the government to discriminate against the female class..."
"But did you debunk many HistSci myths? Our friends in the STEM fields are nice and all, but their grasp of the history of science tends to be woeful at best and riddled with nonsense more often than not." And Thony's story above the comment is fun and worth a read. While the blood libel actually occurred far too often in the Middle Ages, Philip Daileader claims that he has not been able to discover a single instance of a Catholic bishop supporting the charge. Universally, he says, they dismissed the idea as nonsense. Similarly, when hoi polloi of the People's Crusadeattacked Jews in France and Germany, "The Church opposed these attacks, and local clergy often came to the defense of Jews in their community." Jews suffered a lot at the hands of the common people of Europe through the Middle Ages. Almost always, church officials denounced these episodes and tried to protect the Jews from their attackers. But what the heck do mere climate scientists know about the meaning of the findings of climate science? And editor at a conservative website mentioned online that today he had already received four pieces titled "Obama's Munich." With the large number of "Munichs" we have had in the last decade, we should up to about World War VI by now. It is odd that for people who keep telling us we must "learn from history," in the world of the war hawks there never seem to arise any new "Sarajevos," where an empire is brought low by responding too aggressively to a terrorist attack. Apparently, "Munichs" occur every few months, while Sarajevo will never, ever repeat itself. Evolution as a substitute for the market? E. O. Wilson once said of Marxism, "Nice theory, wrong species," by which he was indicating that communism was appropriate for ants, but not for humans. But ants, like human actors, face optimization problems, so how do these get solved, in a complex society, without market prices? Of course, we do not expect ants to have to deal with changing tastes or technological innovations, which human actors must. But they still face environmental changes: a rainy or dry season, an anteater moving into the neighborhood, an invading foreign colony, and so on. "There is a deeper reason for corporate support, however. ­Today’s corporate ideology has a strong affinity with the lifestyles of those who are defined by mobility, ethical flexibility, liberalism (whether economic or social), a consumerist mentality in which choice is paramount, and a 'progressive' outlook in which rapid change and 'creative destruction' are the only certainties." This point cannot be stressed strongly enough: markets are great things, within limits. But it is absolutely incredible that anyone minimally educated in philosophy could recommend such a deranged idea as "markets without limits," except that such an idea will gain great financial support from corporate sponsors, since such derangements will maximize their corporate profits. by hiding the fact it exists! That is the thrust of the new ad campaign for the new Samsung Galaxy S6 Edge: what is terrible about the fact that your are texting instead of watching your daughter's ballet recital is not that you are doing that, but that she caught you! If you are looking at baseball scores when you are supposedly on a date, that is OK: just don't let your date figure that out! This is how capitalism "fixes" the problems created by capitalism! Please don't write an advice book telling me to just accept that fact. If I don't have free will, I don't have the free will to accept or not accept anything. 2) we will be happier if we accept this fact. Well, sorry, if 1) is true, we have no choice about 2)! I Like the Word "Derp"
It acts as a great signal that I never again need to pay the tiniest bit of attention to a single thing said by the person who just used it. Of course, one can fill in an English word wherever one finds 'sa' or 'son' or 'suo' or 'sua,' and vice-versa. But 'his' means 'something possessed by a third-person of masculine gender,' and 'her' means 'something possessed by a third-person of feminine gender. French and Italian do not contain such words. Instead, they have words meaning 'something of feminine gender possessed by a third person' ('sua,' 'sa') and 'something of masculine gender possessed by a third person ('suo,' 'son'). It takes a mental shift for an English speaker to be able to comfortably use the French and Italian possessive pronouns, very similar to what it takes to comfortably drive on the other side of the road in the U. K.
Even if the outlet for which you are writing does not want page numbers accompanying the quotes from the book under review, leave them in until the last minute anyway. That way, if you find a problem with the quote as you are editing, you can go straight to the page from where it came. Furthermore, you may at some point want to rework the material for an outlet that does want page numbers, and you can find them again in your penultimate draft. A man insists that violence is the only way to settle social questions. When you disagree, he says "let's settle this by a fight." And when you refuse, he says, "I win!" Substitute "argument" for "fight," and you have the stealth tactic by which liberalism has hollowed out philosophy and undermined common sense for the last two hundred years. As Alasdair MacIntyre notes, liberal argumentation never settles anything: but that's not the point of it. The point is to leave the average person so morally disoriented that they will wind up acquiescing to auctions for babies and so on. Yesterday, I also got to watch my tutor figure out how to prove something that he had, perhaps, been shown long ago, but had long since forgotten. Proofs have often puzzled me: given a statement like "Prove that x is a Y if z(x) is prime" (I'm making that up but it's the right flavor) I would have no idea where to start. What I saw yesterday is you really don't have to have any idea how the proof itself will start: you start by just writing down everything you know about the problem, and then begin "messing around" with the equations you have. Sooner or later, you (hopefully) will see the "finish line," as my tutor put it, and you will have your proof. Then you can clean things up, and get the concise, knee proves one finds published. No book has ever indicated to me that proofs are done that way! And this is a very Oakeshottian point (or Polanyian, if you like your case for apprenticeship from a scientist). Why Are Books of Mathematics Bad at Explaining Math? OK, so Shonk plus Salman Khan plus my math tutor have convinced me that I put things badly in my initial post on the topic of mathematical education: it is not mathematicians that are bad at explaining math, it is books on mathematics that are bad at explaining math. An example: I have been going through a few of books on linear algebra, looking for one that I can connect with. They all immediately launch into ways of doing things with matrices: adding them, multiplying them, figuring out their determinants, ways of getting their minors, and so on. But none of them have told me what matrices are, or what they are for, other than brief mentions that we can solve systems of linear equations using them. "sin2θ is odious to me, even though Laplace made use of it; should it be feared that might become ambiguous, which would perhaps never occur... well then, let us write (sin θ)2, but not sin2θ, which by analogy should signify sin(sin θ)." -- Gauss-Schumacher correspondence, quoted in Eli Maor, Trigonometric Delights. This must be one of the worst notational choices in mathematics. * Almost everyone known human society has something we can identify as a religion, so an evolutionary theorist ought to suspect this "religion thing" has some adaptive value: but secular progressives generally view it as barbarous nonsense. * Almost every known society has been patriarchal, so one ought to suspect that, for humans, patriarchy has some adaptive value: but secular progressives hate patriarchy, and want to destroy it. At least if the average of which we speak is the mean: "Consider the average number of legs for a human: it’s around 1.999. Almost everyone is above average and no one is average." By the way, the quote is from a good article rejecting scientism. A nice post from Market Urbanism. In fact, there were multiple condemnations of Aristotle's work during the Middle Ages, culminating in a list of two hundred and nineteen Aristotelean ideas that were declared false. This is hardly the attitude of thinkers who "slavishly followed" Aristotle, a claim that is slavishly repeated by those seeking to sully the reputation of that time. A few years ago, I was telling a friend about my new apartment. I mentioned it had five half-flights of stairs. "My God," he said, "that sounds awful." "No, no," I replied, "It's great exercise." "I'd rather get my exercise other ways," was his response. In fact, I knew how he got his exercise: he paid a goodly amount of money for a gym membership, and he would go to that gym four times a week... and use its stair stepping exercise machine for a half-hour! Similarly, I had a friend who paid someone to push a lawnmower around his lawn, and then paid someone else to push weights up-and-down at their gym. This is a notable aspect of modern American life: we only feel good about an activity if we are paying a lot of money to "consume" it. To simply have the exact same activity be a natural part of our daily lives is "drudgery." Do you think marketing might have had something to do with this? In mathematics, it is a virtue when a proof is as minimal as possible: one wants to find the fewest assumptions that are necessary to prove statement X, because using unnecessary assumptions may mask the fact that the statement holds in some domain where one of the unnecessary assumptions does not hold. In my experience, mathematicians, having been (correctly) trained in this minimalist approach to proofs, unfortunately carry it over into their explanations of mathematical concepts, so that they try to explain a concept employing the absolutely minimum amount of explanatory apparatus possible. But what is a virtue in a proof is not necessarily a virtue in an explanation: students can often benefit from logically superfluous stories, examples, counter-examples, metaphors, and so on. Few mathematicians seem to realize that such ornamentation can make an explanation better. As I have mentioned, the astonishing number of really foolish things I've heard said in the SSM debate sometimes gets to me. One thing I've heard from SSM proponents on a number of occasions is that a law that allows heterosexuals to marry their partners of choice, but does not allow homosexuals the same freedom, "is discriminatory." Well, of course it is! So are laws that stop brothers from marrying sisters, parents marrying their children, and those already married from marrying again. Laws that put robbers in jail discriminate between robbers and non-robbers. Laws that fine polluters discriminate against those who pollute. I am currently reading From Mathematics to Generic Programming by Stepanov and Rose. It is a very good book that has me thinking hard about how to render my agent system more generic. Common measuresNatural numbers IntegersRational numbersPolynomialsReal numbersComplex numbersGroupsRingsFields I think it important to note how this happened: no one sat down and devised an abstract algebra of rings and fields, and then said, "So farmers: I think you can derive something from this to measure your fields." No, people started out measuring fields and buildings and so on, and gradually, over a period of thousands of years, abstracted higher-level constructs from these concrete applications. I dictated: "to stop the ship from sinking." Siri thought the best choice for the final word there was "syncing."